The events that make emergency evacuations necessary often kill a building’s power, leaving its occupants in darkness as they attempt to flee. In 1993, a terrorist attack on the World Trade Center complex had precisely this effect. As a result, evacuation took six hours. Following the attack, photoluminescent exit path markings were installed in the Trade Center’s buildings. During the terrorist attack of September 11, 2001, more than 16,000 people were evacuated in just 102 minutes. This dramatic example helps to explain why the 2009 and 2012 International Building and Fire Codes include sections on photoluminescent exit path markings. Due in part to recommendations from the U.S. National Institute of Standards and Technology, the codes indicate that buildings whose height equals or exceeds 75 feet must have photoluminescent markings in emergency escape stairwell enclosures in order to facilitate speedy evacuation. Studies performed in 1999 and 2007 revealed that photoluminescent exit path markings are just as good as standard lighting at ensuring rapid evacuation. The studies also showed that an excess of photoluminescent markings can overpower evacuees, while a dearth of markings may inadequately define the escape path. Both conditions can significantly delay evacuation. The aforementioned international codes recommend that photoluminescent markings be installed on handrails, stair treads and landings, exit doors, and directional signage. Any material may be used as long as electricity is not required to maintain its illumination. American manufacturers of photoluminescent markings include 3M, AfterGlow, Bright Path Lighting, Glow Zone, and U.S. Phosphor. Modern photoluminescent markings are less expensive and more effective than those produced in the past. They often cost only a few cents per square foot, and they can work for more than 25 years without requiring maintenance. Photoluminescent markings are currently used in commercial and government buildings, boats and planes, and even the International Space Station. Photoluminescence works according to very simple principles. Inorganic phosphors are present in a carrier or substrate; these phosphors absorb visible and ultraviolet light and subsequently release visible light. Tape, solvent- or water-based paint, and acrylic or polyurethane casting are among the materials that may be used to create photoluminescent markings. Photoluminescent paint “charges” through exposure to sunlight, fluorescent or incandescent light, ultraviolet light, or flashlight beams. Once charged, it can provide more than eight hours of visibility. It takes seven or eight minutes to charge in direct sunlight and three times as long in fluorescent light. When fire is part of an emergency situation, smoke may hide electrical exit signs. In addition, backup power may be switched off by firefighters in order to ensure their safety and that of the building’s occupants. Photoluminescent exit signs can thus be a wise investment for building owners. The photoluminescence of glow-in-the-dark Halloween skeletons is powered by zinc sulfide. 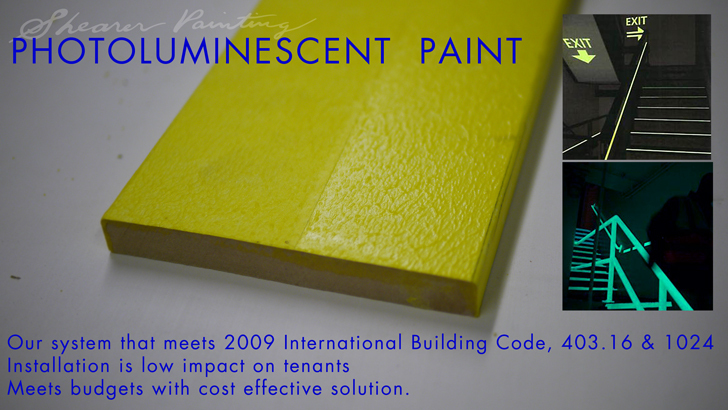 Photoluminescent markings that meet building and fire codes use strontium aluminate, which produces a more powerful and long-lasting glow. It is nontoxic and non-radioactive and can maintain its photoluminescence for more than 30 years. Electrical signs add to a building’s utility costs and must be tested and maintained on a regular basis. In many cases, photoluminescent markings are a less costly, more efficient alternative.